The list of safe bets for announcements at this year’s Game Awards is getting long, and now we can add a remake of CTR: Crash Team Racing to the list. A small, orange, fuzzy tease points to the official reveal later this week, and it looks like Activision aims to follow up on the tremendous success of previous PlayStation One remakes by bringing back the kart racer. Hollie Bennett, manager of PlayStation UK’s official YouTube channel, noted the arrival of an unusual package on social media. It contained a pair of orange, fuzzy dice and a note that something will be “sliding into the Game Awards” on December 6. Fuzzy dice suggests cars and orange fuzz suggests gaming’s favourite bandicoot. It’s also similar to the purple egg used to tease the Spyro remaster. As Eurogamer notes, this isn’t the first time the possibility of a CTR remake began floating around the internet. Hints toward the news surfaced on Facebook earlier this week, though it should be noted that this same page teased a CTR announcement for June. Obviously that one didn’t pan out, but there’s a lot more supporting detail this time around. But following up on the massive success of the Crash and Spyro remakes, it’s likely that Activision will want to keep the PS1 nostalgia rolling, and CTR would be a great fit. It was the last Crash game developed by Naughty Dog, before that studio moved onto Jak & Daxter on the PS2, and before the series lost its luster amid infinite sequels developed by various other studios. Even if the remake is looking likely, we have to wonder how long it’ll be before it comes to PC. 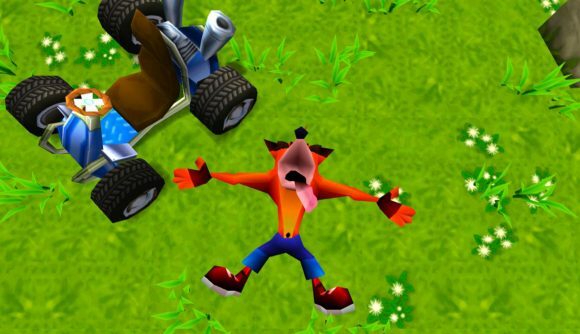 The first batch of Crash remakes launched exclusively on PS4, and it was a full year before that package came to other platforms. The similar Spyro Reignited Trilogy came to both PS4 and Xbox One last month, but despite rumours we’re still waiting for a PC release. As we await the full range of The Game Awards announcements, check out our list of the best old games on PC. One of the myriad advantages of PC gaming is that you can continue to enjoy the best games of yesteryear on modern machines without having to wait for an official remaster.